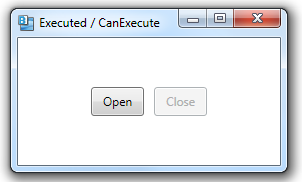 When you associate a button’s Command property with a CommandBinding object,and bind the CommandBinding object to both Executed and CanExecute handlers, the Button control will automatically toggle between enabled/disabled, depending on the code in the CanExecute method. Suppose we create two buttons, binding them to open/close commands. Then we create a CommandBinding and associated handlers. The buttons will now automatically be enabled/disabled, depending on the value of isOpen.